ST. LOUIS, MISSOURI, UNITED STATES OF AMERICA, June 12, 2018 /EINPresswire.com/ -- SubscriberWise, the nation’s largest issuing consumer reporting agency for the communications industry and the leading identity protector for babies for girls and for boys, announced today the OBJECTION TO SUBPOENA DUCES TECUM and the attempted grand theft in the state of Florida following a fraudulent $502.80 ‘ding and dent’ scam by tortfeasor Enterprise Holdings’ National Car Rental. 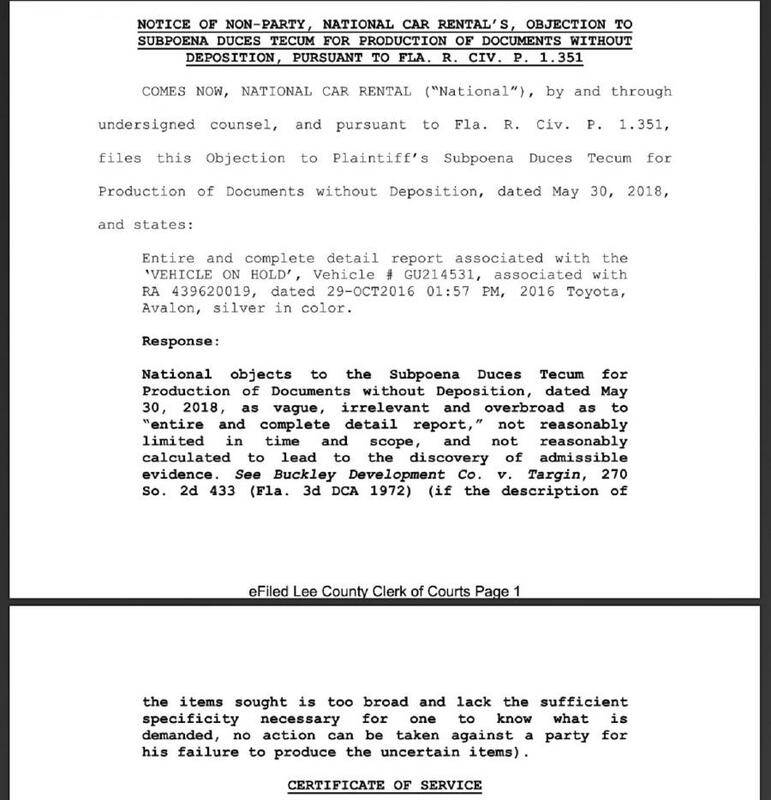 According to SubscriberWise, the eleventh-hour objection reveals a desperate attempt to hide evidence that was, ironically, exposed by a National Car Rental agent during the commission of the theft attempt at the SW Florida Fort Myers International Airport on October 29, 2016. Remarkably, SubscriberWise reports—within hours of the launch of the Lee Port Authority Police criminal investigation and Wink News’ cameras rolling at the SW FL Fort Myers International Airport—an Enterprise Area Manager urgently contacted the crime victim and cried ‘human error,’ promising the ‘grand theft’ (http://www.leg.state.fl.us/statutes/index.cfm?App_mode=Display_Statute&URL=0800-0899/0812/Sections/0812.014.html) money demand would end immediately. The nation’s first Issuing consumer reporting agency (CRA) for the communications industry, SubscriberWise® employs enhanced Subscriber Level Segmentation technology to precisely identify credit challenged subscribers to ultra-high achievers to maximize sales and boost profits. By incorporating years of communications performance data and proprietary decision models, SubscriberWise delivers unprecedented predictive power with a fully compliant, score-driven decision management system. Combined with Red Flag compliance and operator-controlled rules, SubscriberWise analytics empower CSR's to instantly and accurately respond to payment and credit characteristics with appropriate options for every subscriber. With SubscriberWise, no subscriber request is ever denied because of credit risk factors. SubscriberWise contributions to the communications industry are quantified in the billions of dollars annually. SubscriberWise is a U.S.A. federally registered trademark of the SubscriberWise Limited Liability Co.